Warby Parker is expanding their presence in LA in a big way. The vintage-inspired prescription eyeglass store first opened its Los Angeles location at the Standard Hotel in 2013. Since then, they have opened additional stores in the Arts District and Venice. The fourth Los Angeles location is one of the most exciting ones yet hinging on a Hollywood theme. 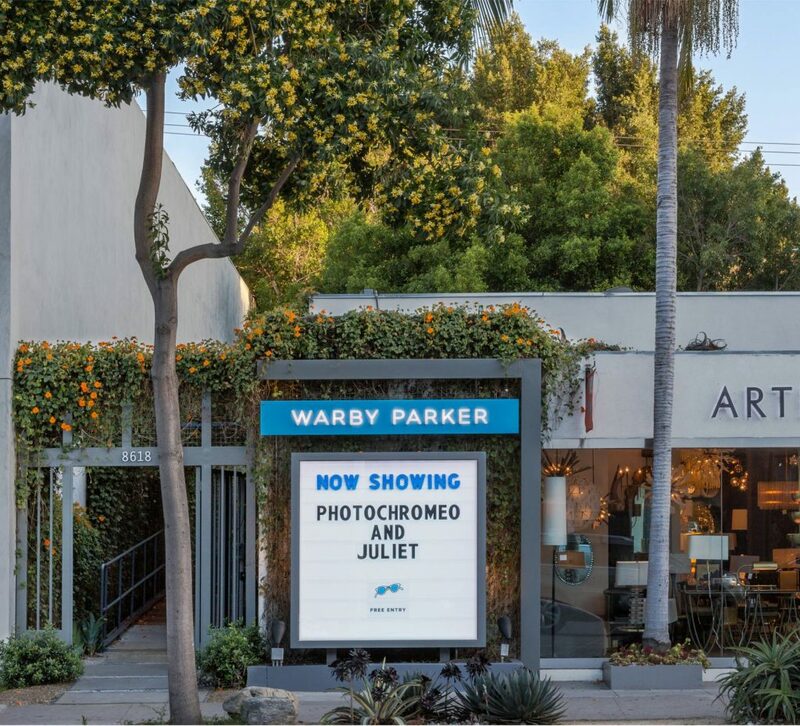 The Warby Parker Green Room is located on Melrose Avenue, tucked in the middle of the West Hollywood Design District. Aside from stylish frames, this concept shop includes a full scale green room where customers can record their own :15 videos against quirky, custom made backdrops. Step inside the Warby Parker Green Room and make your very own cinematic debut. Once recorded, you can send them straight to your phone for easy access. These fun backgrounds are true Instagram bait. Some of the backgrounds you can expect are a giant pepperoni pizza, palm tree lined boulevard and depths of the ocean, to name a few. To amp up your green room video you can play around with some props, such as a giant green blanket and opaque green glasses. These props are essential for vanishing bodies and floating heads. You can even have your eyes blend into the background for some cool effects. Search for some video inspiration and share your own by using #warbygreenroom. Once you’ve gotten your on-screen fix, head over to the marble Reference Desk where you’ll find a movie-theater-style marquee sign and shelves filled with classic clap boards. It is clear that the store’s inspiration playfully pays homage to classic Hollywood. To the side of the desk you’ll find a colorful original mural by L.A based artist Alia Penner. Penner is also responsible for some of the green room backdrops! The mural’s bold and vibrant shapes are collaged behind the black and white LA cityscape. This mural brightens up the store. Finding the perfect frame won’t be hard with the Warby Parker advisors standing by to give you great style and fit advice. You’ll be sure to walk out of the store looking fresh in your new frames. Be prepared to step out of the Warby Parker Green Room feeling happy and looking good.